As violence spread through the Holy Land in 2001, educators in Jerusalem dreamed of a safe place where Jewish, Christian & Muslim children could meet face to face, play together as kids, cross social divides, and share stories of their lives. Kids 4 Peace is still going strong! Christian churches are known to hold Vacation Bible School programs for their communities during the summer. Sleep-away camps are also sponsored by denominational bodies. Summer camp is a formational experience for camper and counselor alike. And there are ways in which summer camp can make a difference in the world. As violence spread through the Holy Land in 2001, educators in Jerusalem dreamed of a safe place where Jewish, Christian & Muslim children could meet face to face, play together as kids, cross social divides, and share stories of their lives. Twelve courageous families from Jerusalem’s three faiths gathered at St. George’s College, in the Episcopal Diocese of Jerusalem. With trusted adult advisors, their children flew to Texas for a summer camp in 2002. And Kids4Peace was born. Kids 4Peace is a nonsectarian, nonpartisan, nonpolitical education for peace organization. Their programs focus on Jewish, Christian and Muslim religious communities in the United States and the Jerusalem area, including Ramallah and Bethlehem. 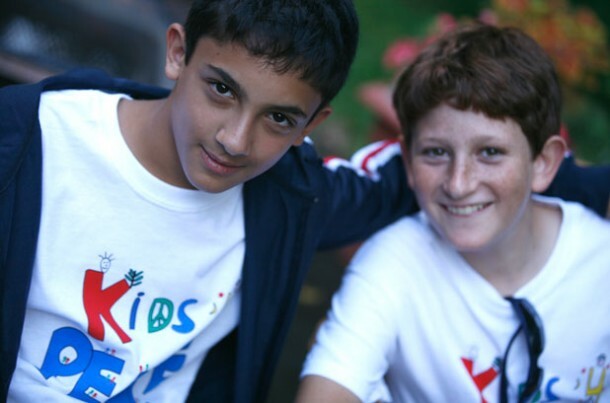 Kids4Peace USA is a member of the Alliance for Middle East Peace, a coalition of over 60 non-governmental organizations (NGOs), who promote people-to-people coexistence between Arabs and Jews, Israelis and Palestinians in the Middle East. Through ALLMEP, the NGOs work together to raise awareness about the extent and importance of their work, as well as cultivate new and expanded resources to support Middle East coexistence. Read about the recent experience of summer camp in Georgia with 2 dozen 11-13 year old Muslims, Jews and Christians at Climbing Stone Mountain.